The modern detainee in a political sense has to be understood in the abstract. Those who take to feats of hacking, publishing and articulating positions on the issue of institutional secrets have become something of a species, not as rare as they once more, but no less remarkable for that fact. And what a hounded species at that. Across the globe prisons are now peopled by traditional, and in some instances unconventional journalists, who have found themselves in the possession of classified material. In one specific instance, Julian Assange of WikiLeaks stands tall, albeit in limited space, within the Ecuadorean embassy in London. Unlawful imprisonment and arbitrary detention are treated by black letter lawyers with a crystal clarity that would disturb novelists and lay people; lawyers, in turn, are sometimes disturbed by the inventive ways a novelist, or litterateur type, might interpret detention. The case of Assange, shacked and hemmed in a small space at the mercy of his hosts who did grant him asylum, then citizenship, has never been an easy one to explain to either. Ever murky, and ever nebulous, his background and circumstances inspires polarity rather than accord. What matters on the record is that Assange has been deemed by the United Nations Working Group in Arbitrary Detention to be living under conditions that amount to arbitrary detention. He is not, as the then foreign secretary of the UK, Philip Hammond claimed in 2016, “a fugitive from justice, voluntarily hiding in the Ecuadorean embassy.” To claim such volition is tantamount to telling a person overlooking the precipice that he has a choice on whether to step out and encounter it. The whole issue with his existence revolves, with no small amount of precariousness, on his political publishing activity. He is no mere ordinary fugitive, but a muckracker extraordinaire who must tolerate the hospitality of another state even as he breathes air into a moribund fourth estate. He is the helmsman of a publishing outfit that has blended the nature of journalism with the biting effect of politics, and duly condemned for doing so. Given such behaviour, it was bound to irk those who have been good enough to accept his tenancy. The tenancy of the political asylum seeker is ever finite, vulnerable to mutability and abridgment. Assange’s Ecuadorean hosts have made no secret that they would rather wish him to keep quiet in his not so gilded cage, restraining himself from what they consider undue meddling. To do so entails targeting his lifeblood: communications through the Internet itself, and those treasured discussions he shares with visitors of various standings in the order of celebrity. On March 27, his hosts decided to cut off internet access to the WikiLeaks publisher-in-chief. Jamming devices were also put in place in case Assange got any other ideas. Till that point, Assange had been busy defending Catalan separatist politician Carles Puigdemont against Germany’s detention of him, in the process decrying the European Arrest Warrant, while also questioning the decisions made by several European states to expel Russian diplomats in the wake of the poisoning of double agent Sergei Skripal and his daughter. It was just that sort of business that irked the new guard in Ecuador, keen on reining in such enthusiastic interventions. 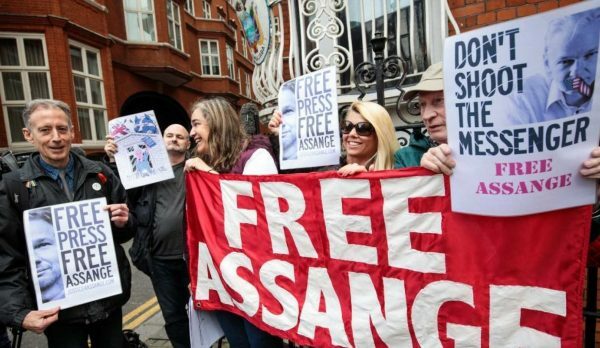 What seems to be at play here is a breaking of spirit, a battle of attrition that may well push Assange into the arms of the British authorities who insist that he will be prosecuted for violating his bail conditions the moment he steps out of the embassy. This, notwithstanding that the original violation touched upon extradition matters to Sweden that have run their course. Times, and the fashion, has certainly changed at the London embassy. Current President Lenín Moreno announced in May that his country had “recently signed an agreement focused on security cooperation [with the US] which implies sharing information, intelligence topics and experiences in the fight against illegal drug trafficking and fighting transnational organized crime.” Tectonic plates, and alliances, are shifting, and activist publishers are not de rigueur. Both President Donald J. Trump and Russia provide the current twin pillars of journalistic escapism and paranoia. Be it Democrat or Republican in the US, the WikiLeaks figure remains very wanted personifying the bridge that links current political behemoths. For the veteran Australian journalist John Pilger, “The fakery of Russia-gate, the collusion of a corrupt media and the shame of a legal system that pursues truth-tellers have not been able to hold back the raw truth of WikiLeaks revelations.” Such rawness persists, as does the near fanatical attempt to break the will of a man who has every entitlement to feel that he is losing his mind.